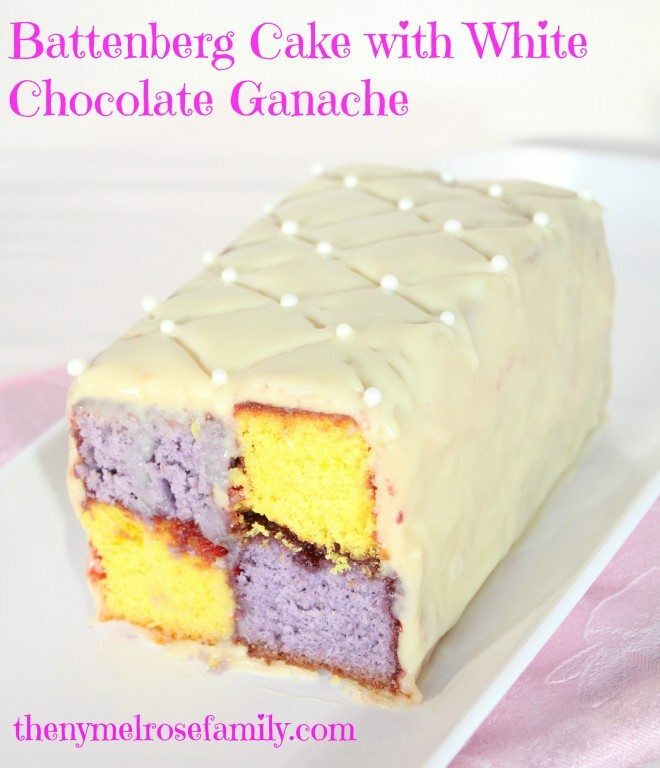 I’m so excited to share my first ever Battenberg Cake with White Chocolate Ganache. A Battenberg Cake is a perfect cake to serve with tea and looks absolutely amazing. If there is one thing that my mom loves, it’s tea. One of the first gifts she ever gave Riley was a tiny tea set. Riley has always made the connection between tea and her grandma. This cake would work wonders for any Mother’s Day dessert. It honestly is just breathtaking with it’s pearl dragees on top and two tone sponge cake. Your battenberg cake looks lovely. I’ve never made one but would love to try it. Thank you so much Annamaria. I originally planned on using marzipan so it was a last minute switch to go with the white chocolate plastique and ganache. Wow how pretty! And I love the sound of a white chocolate ganache. This is almost too elegant to eat! You are too sweet! I was extremely proud of the cake. We brought it to my parents house for Easter and I made my husband hold it on his lap the entire 40 minute drive. I love this Jenny! It is SO pretty. I need to make one of these cakes! Thanks so much Dorothy. Mid way through I thought it was going to be a disaster, but I loved the way it came out. This is an absolutely stunning cake Jenny, great job! I love the colors and that frosting is to die for! Yum, looks delicious! And it’s so pretty! Pinned to my food board. Have a great week, Jenny! Thanks so much Julie! Thanks for pinning as well! Ha – I see we are both featuring Mother’s Day dessert ideas today and I absolutely had to feature THIS one in my own round-up! Love! Thanks so much for including my Battenberg Cake in your round up Claire! I.love.this.cake. This is so beautiful! I think you chose the perfect colors, too! Well done, Jenny, well done! Totally pinned! Thanks so much! It was a definite labor of love. It’s looks so pretty! Love the colors!! Thank you Erin. My 3 year old loves purple and her bf loves yellow so it was an easy choice. So fancy! I always wondered how these cakes were made, this actually looks doable, thanks so much for sharing! This cake is beautiful Jenny! I love how you showed the steps – I can’t wait to give it a try! Oooh! So pretty! And the sponge looks so moist and delicious. I love white chocolate in just about any form and this cake just doubles the pleasure with the plastique and the ganache. Win/win!! Thanks for sharing it! Found you through the Wonderful Wednesday link party. Hope you’ll stop over and see what I made, too! This is just a beautiful, beautiful cake…love the colors and its simple elegance. Pinned it. found you at showstopper Saturday. Have a great weekend! This looks amazing!!! normally I don’t like batternberg, as I don’t like marzipan. But White Chocolate Ganache!!! Oh My!!! What a beautiful cake! Love the pattern inside!